ONTARIO – Yesterday Jan. 24, Vale announced that it will decommission the iconic Superstack at its Copper Cliff smelter in Sudbury in Q2 2020. It will be replaced with two smaller, more efficient 137-metre stacks. VP Stuart Harshaw told the audience that drastic cuts to emissions from the Copper Cliff smelter mean that the Superstack will be replaced by a pair of shorter, more efficient chimneys. Construction of the Superstack began in 1970 with a budget of $25 million, becoming operational in 1972. At 381 metres high it is the tallest chimney in the western hemisphere and the second tallest in the world. Moreover, the only freestanding structure in Canada that is taller than the Superstack is the CN Tower. The two new stacks will require far less energy to operate than the Superstack, reducing greenhouse gas emissions from Vale’s smelter by approximately 40%. 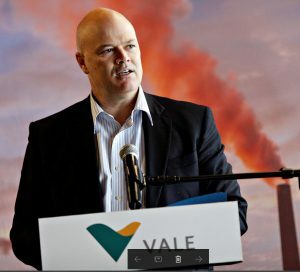 At the same time, Vale’s $1-billion Clean AER project will reduce particulate emissions by 40% and sulphur dioxide emissions by 85%. By changing to two smaller and more efficient stacks, natural gas consumption is estimated to drop by nearly half, to 48 million m3/y from 94 million m3. This savings is equivalent to the average fuel consumption of approximately 17,500 homes, or approximately one-third of all the households in Greater Sudbury. Construction of the two new stacks will begin in early 2017 and will take approximately two years to complete. The Superstack will be placed on care and maintenance in the second quarter of 2020 as extensive study is conducted to determine the best way to safely and carefully demolish its concrete shell. Vale insisted there is no immediate need for the shell to be demolished and it is expected to remain a part of the Sudbury skyline for several years to come. An overview of Vale’s activities in Canada is posted at www.Vale.com/Canada.